Although King George III was later burned in effigy in the streets of the colonies, his relaxed ruling style inspired little ire among the colonists in the 1760s. In 1763, few would have predicted that by 1776 a revolution would be unfolding in British America. The ingredients of discontent seemed lacking — at least on the surface. The colonies were not in a state of economic crisis; on the contrary, they were relatively prosperous. Unlike the Irish, no groups of American citizens were clamoring for freedom from England based on national identity. 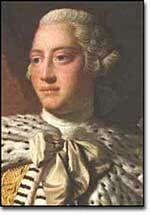 King George III was not particularly despotic — surely not to the degree his predecessors of the previous century had been. Furthermore, the colonies were not unified. Benjamin Franklin discovered this quite clearly when he devised the Albany Plan of Union in 1754. 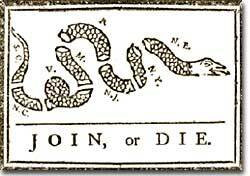 This plan, under the slogan "Join, or Die," would have brought the colonial rivals together to meet the common threat of the French and Indians. Much to Franklin's chagrin, this plan was soundly defeated. Ben Franklin sketched this cartoon to illustrate the urgency of his 1754 Albany Plan of Union. He unsuccessfully tried to bring the colonies together to defend themselves against Indian and French threats. How, then, in a few short years did everything change? What happened to make the American colonists, most of whom thought of themselves as English subjects, want to break the ties that bound them to their forebears? What forces led the men and women in the 13 different colonies to set aside their differences and unanimously declare their independence? Much happened between the years of 1763 and 1776. The colonists felt unfairly taxed, watched over like children, and ignored in their attempts to address grievances. Religious issues rose to the surface, political ideals crystallized, and, as always, economics were the essence of many debates. 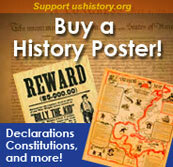 For their part, the British found the colonists unwilling to pay their fair share for the administration of the Empire. After all, citizens residing in England paid more in taxes than was asked of any American during the entire time of crisis. 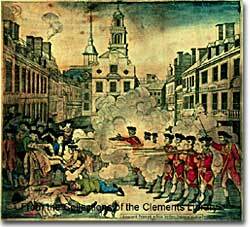 The 1770 Boston Massacre was only one in a series of events that led American colonists to revolt against Britain. This was not the first time American colonists found themselves in dispute with Great Britain. But this time the cooler heads did not prevail. Every action by one side brought an equally strong response from the other. The events during these important years created sharp divisions among the English people, among the colonists themselves, and between the English and the Colonists. Over time, the geographic distance between England and the colonies became more and more noticeable. It took England time to respond to Colonial provocations and to administer the settled areas of America. Further, some now questioned how it could be that a tiny island nation could contain and rule the American continent. Before long, the point of no return was reached. What happened to Benedict Arnold's leg after the Battle of Saratoga? How many colonists remained loyal to the British crown during the Revolution? Play this "Revolutionary game" to find out. The stage was set for revolution with events ranging from the Proclamation of 1763 to the Coercive Acts of 1775. What happened in between? This detailed timeline might help. The colonies raised, clothed, and paid, during the last war, near 25,000 men, and spent many millions ... We were only reimbursed ... a very small part of what we spent. -Benjamin Franklin. What else did Franklin say in his 1766 testimony before the British Parliament?